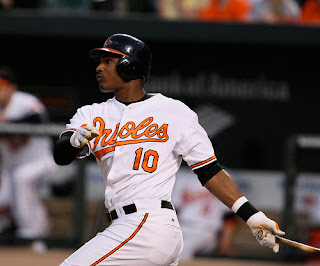 Today is a day that I would definitely like to have Adam Jones as a Seattle Mariner. As the M's finished the day with a measly five hits, Adam Jones finished with three. Not including a huge catch in center, robbing Miguel Olivo of a sure extra base hit. One of the best catches I have ever seen. The Mariners really couldn't get anything going. Brendan Ryan's hitting streak ended, Smoak hit into a double play and the M's only run came on back to back hits by Olivo and Jack Wilson. So, the question still remains for the M's. Where is our offense going to come from? Even though we are winning series after series and we're all excited, we cannot continue as we are. So, where do we pull from? Everybody wants to talk about Dustin Ackley, myself included, but is that enough? I was commenting last night about how when we played the Twins and Jim Thome came to the plate I was worried sick every time. Or when Texiera came up to bat for the Yankees. These are guys that strike fear into the opposition and they make things happen. They also lift the game of others in the lineup because those around them see better pitches. You aren't going to walk a guy and then pitch to Texiera. You aren't going to intentionally walk Jim Thome and not give the next batter anything to hit. This is how it works and it always has worked like that. We have the Ichiro, Figgins combo at the top of the order, if that was working and we had them on base with Smoak up to bat followed by a Texiera or a Thome type bat, how much better are the pitches that Smoak sees? Better than what he's seeing right now. So, although Ackley will be a welcomed addition and really fun to watch, I can't say that this is what the M's are searching for in their offensive woes. Although this year was a year designed to evaluate our young talent and prepare for next year or the year after, the Mariners find themselves just a game and a half out of first at the start of June and with one of the best pitching staffs in baseball. To Compete, or not to compete? That is the question! If the M's decide that they are going to make a run to win the division this year, what are their options? Do we trade for a Prince Fielder or Carlos Beltran who would only be with us for a couple months before hitting free agency at the end of the season or do we wait it out and try our hand at free agency in the off-season? Do we pick up a guy that is a proven veteran that has been sitting on his couch for two years like Jermaine Dye? Or, do we just hope for the best in what we currently have and just assume that everything will just fall into place. I for one would like to Hire a Bat. Maybe we already have one but we aren't giving the opportunities to the right players.